Great question, Jennifer. We’re about the same age. Even as I sit here writing this I feel a little sciatica kicking up. If you’re reading this and think the challenge doesn’t apply to you, consider . . .
. . . do you have an aging parent?
. . . or young children? . . . or grandchildren?
. . . or back pain? or bunions? or body fat? As my farming friends advise, ideally all of us would learn to live now as we would have to live then, should the lights go out. This is, of course, easier said than done, but not impossible. The main barrier to living “off the grid” is deciding what you actually believe: will the lights indeed go out? But in a survival situation, everyone needs to contribute something. Even children can collect firewood. Though you are disabled, you, too, likely have something you can contribute – perhaps medical knowledge, since you’ve been through so much. Perhaps you have financial means, or have a green thumb, or woodworking skills. Nearly everyone can contribute something. I realize there are those who can contribute little – for example, a patient I see regularly who is blind, mentally retarded, and mobility impaired. What will happen to her? She will not survive without the kindness of others, but even she could pedal a bicycle for power if her life depended on it. My best advice is: 1) become part of a group – or start your own, and 2) develop a skill that others will need and you can contribute. (And this advice goes for everyone, really.) Then start practicing now for when things do go bad – live without electricity for a day, then a week, then a month. These summer months are an ideal time to begin. 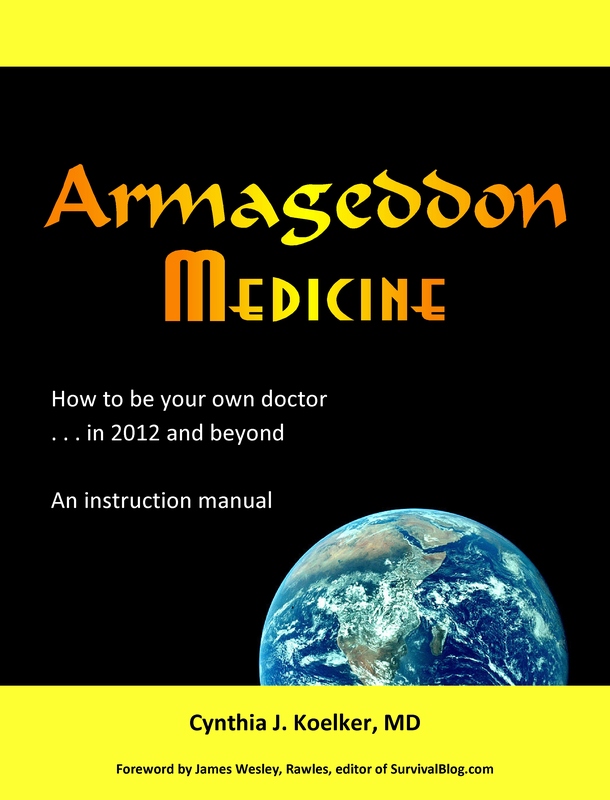 Work with your group to develop a transportation plan, battery back-up for an oxygen concentrator, alternatives to the medications you are taking (check out other articles on this site and/or the book, Armageddon Medicine). We all have limitations and need to work together. For my own part, I am teaching medical skills (and leaving the guns to my sons). This web site is all about taking care of yourself and others. I hope to teach thousands, perhaps millions, before the grid goes down. If you will be, or want to be, a medical provider, now’s the time to start learning. Perhaps, Jennifer, you, too could be a healer. This entry was posted in Asthma, Chronic diseases, COPD, Heart disease, Medical archives, Preparation, Question of the Week, Shortness of breath, Slide show and tagged Daniel Boone, Lung, Oxygen concentrator. Bookmark the permalink. 4 Responses to What if you’re not young and healthy? Cynthia , I do have one suggestion. I would like to see a book akin to a McGyverguide for medical personnel. Example: Using everyday items that may be laying around for medical procedures. I once saw a medical show on TLC where a doctor used the tube from a bic pen as a trach tube. I know that would not be ideal due to the lack of sterility, but if someone is going to die in a SHTF situation, I might be inclined to take my chances with the pen tube and worry about treating the possible infection later. Maybe there is already a book like this out there, but I haven’t run across it yet. Sorry, my computer cut me off. Anyway, I have always had a knack for seeing the disease before anyone else. (In people, horses, dogs, cats, etc.) I suppose I can see something is very wrong before anyone else sees it. And thus far, I have never been wrong. I am not in any way saying I am educated or even qualified to treat anyone today. However, I plan to study practical medical procedures and learn as much as I can so that I might provide some value to my family and my community in a TEOTWAKI situation. My best friend’s father (a doctor) was always happy to talk to me about patient care and medical procedures and he died way too soon. It is hard to find a doctor willing to share their knowledge and experience. So thank you for your support.